Avid readers of dramatic novels from yesteryear will recall stories from the days when fevered patients were watched over by family, and the oldies in the group just “knew” that a proper fever would “break” with a sweat. When that happened, they knew that the prognosis would be good. Of course, such sentiments today would be greeted with alarm, or scepticism, by those who consider illness should never be endured. Isn’t that why acetaminophen (in all their different brand names) is reached for, at the first sign of a fever? 1 made me look twice. “Sweat has the power to fight off disease.” We were told that sweat contains a versatile antibiotic that may be on the front line against disease-causing bacteria and that: “The researchers said dermcidin probably plays a key role in the innate immune responses of the skin”. A news roundup from the British Medical Journal told us2 that dermcidin killed escherichia coli, enterococcus faecalis, staphylococcus aureus and Candida albicans. It was active at high salt concentrations and the acidity range of human sweat. In concentrations of 1–10 μg/ml, it killed all of the staph aureus colonies in only four hours. Unsurprisingly, the scientists didn’t know how dermcidin worked. 3 said that during some inflammatory skin disorders and wound healing, skin cells functioning within a salty sweat with a pH of 4–6.8, produced many effective pharmacologically active substances, such as immunoglobulin A, interleukin 1, 6 and 8, tumour necrosis factor, transforming growth factor β receptor, epidermal growth factor, and a prolactin-inducible protein. Properly fed, healthy children, whose parents know what to do, and what not to do, will rarely get any complications to chickenpox. As was the case for our children, well-managed chickenpox should not even lead to any scarring. So let’s ask some questions here, with chickenpox in mind. What is the function of fever? Not so simple is this sentence. Fever switches on the chemical messengers and processes which call on the body immune system to respond and “modify” or deal with the infection. which can infect the pox rash and so have access to the body, what do we want the immune system to do? It’s pretty obvious isn’t it? to allow the body temperature to rise to the level it needs so that all the on-switches can be thrown. the body to send out all those little chemical messengers which get the antiviral side of things going. We want the body to recognize the virus, ring the bell and sound the red alert (fever) to fight, don’t we? Why, then, turn the fever off with acetaminophen products? Doesn’t that defy logic? Treating fevers is dicing with more severe infection, and a greater likelihood of death, because fever is a key immune response to get the immune system working properly. You mess with fever, and you mess with lots of things. It stands to reason. Do you need to know what the medical profession does not yet know about fever in its totality, to see that? but not, it seems, the public. decreed that when parents used drugs to “treat high fever and severe illness”, drug use was merely the identifying factor of who was at high risk for secondary bacterial infection! That interesting little word “coincidental” again. … I see the increase in these infections as evidence of a total lack of common sense about how to prevent complications. I see the association between nonsteroidal anti-febrile drugs and GAS as a predictable outcome of the loss of home nursing skills and handed-down generational wisdom. I see the increase in secondary bacterial infections as something which can stem from parental lack of understanding that messing around with fever, and using symptom-suppressing/immune-suppressing drugs can restrict the ability of the immune system to fi ght the virus. It also reduces the ability of the leucocyte system of neutrophils, macrophages and phagocytes to fight bacterial toxins from secondary bacterial infections. As pointed out in Chapter 70, if you don’t have enough vitamin C in your system, then the neutrophils won’t be recognized by the macrophages, and you might be in big trouble, because if that happens, the result could be toxic shock/sepsis taking hold very quickly. Even if you have enough vitamin C, if the amount of GAS toxin is such that the glucose transporters (which are part of the vitamin C shuttle service which takes ascorbate from A to B) are blocked, that can result in a GAS infection which threatens to run out of control. The quickest way to restore the immune function in a case of sepsis is by giving vitamin C intravenously. The body can fight sepsis by itself, but it’s a bit more of a lottery as to whether it will succeed if it doesn’t have the tools to do the job. BERLIN — October 8, 2008 — The reported use of paracetamol (acetaminophen) in the first year of life is associated with increases in reported symptoms of asthma and risk of severe asthma symptoms in children aged 6 to 7 years, according to analysis of data from the multicentre, multicountry, cross-sectional International Study of Asthma and Allergies in Children (ISAAC). The study also found an association between use of paracetamol in childhood and an increased risk of symptoms of rhinoconjunctivitis and eczema in childhood, said principal investigator Richard Beasley, MD, Medical Research Institute of New Zealand, Wellington, New Zealand. The increased international use of paracetamol over the last 40 years occurred contemporaneously with an increased prevalence of asthma, Dr. Beasley said during a presentation on October 7 at the European Respiratory Society (ERS) 18th Annual Congress. “[This study] was based on a hypothesis that was raised 10 years ago, where it was proposed that the switch from aspirin to paracetamol in childhood may have contributed to the increase in asthma prevalence that was noted in many countries in the 1980s,” he said. Therefore, Dr. Beasley and colleagues conducted a study to investigate the association between paracetamol use in infancy and self-reported symptoms of asthma in children aged 6 to 7 years participating in the ISAAC program, which was formed in 1991 to facilitate research into asthma, allergic rhinitis, and eczema. Data were obtained from 2 groups (children aged 6 to 7 and 13 to 14) from random samples of schools in defined geographical areas worldwide. Samples were collected using 2 simple standardised questionnaires that were completed by the children’s parents or guardians. The prevalence questionnaire obtained data regarding symptoms of asthma, rhinoconjunctivitis, and eczema in these children, while the environmental questionnaire obtained data on a wide range of putative protective and risk factors for asthma and allergic disorders, including paracetamol use for fever in the first year of life. A total of 194,555 children from 69 centres in 29 countries were included in the analysis, with the multivariate analysis based on 105,041 of these children with complete covariance data. This multivariate analysis of the associations with paracetamol use showed significant odds ratios (ORs) as follows: asthma, 1.46 (95% confidence interval [CI], 1.36-1.56); rhinoconjunctivitis, 1.48 (95% CI, 1.38-1.60); and eczema, 1.35 (95% CI, 1.26-1.45). When severe asthma symptoms were defined as wheezing causing sleep disturbance or limiting speech, or 4 or more attacks of wheezing in the past 12 months, a similar significant association was seen at the multivariate level for the use of paracetamol (OR, 1.43; 95% CI, 1.30-1.58). The study was published in The Lancet in September 2008 (Beasley R et al. 2008;372:1039-1048). The Food and Drug Administration will rewrite decades-old federal regulations governing how over-the-counter cold and cough medicines are marketed to children amid concerns over whether the products are safe and effective. The FDA is revisiting marketing rules. As part of that effort the agency held a daylong hearing Thursday to solicit views about how the rules should be changed. While the effort is expected to take years, the end result could be a tougher regulatory environment for many over-the-counter cold and cough products — such as requiring drug makers to seek approval for their products in a manner similar to that for prescription drugs. 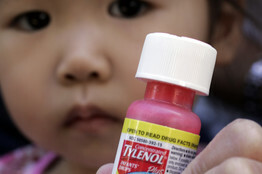 An estimated 95 million packages of children’s over-the-counter cold and cough medicines are sold each year in the U.S. under a range of brand names, including Johnson & Johnson‘s Tylenol Plus Cold, Novartis AG’s Triaminic and Wyeth’s Robitussin, according to industry estimates. John Jenkins, the FDA’s office of new drugs director, said the system that currently governs over-the-counter cold and cough products was really designed to grandfather the over-the-counter medicines that were on the market in the 1960s. The system allowed certain active ingredients (such as those in decongestants) to be legally marketed without obtaining prior FDA approval for each individual product. The studies used to establish the safety of those ingredients were mostly done in adults; current dosing recommendations for kids are simply reduced from adult doses. Antibiotics cause a stall out or dying off of intestinal flora, which kills the e.coli in the gut. When killed, the endotoxin located in the e.coli’s outer coating is released, which often causes a cascade of health issues to result. Endotoxemia affects the glutathione biochemical pathways, which are also a key component of the immune system, among other vital functions. Taking a single course of a certain type of antibiotic gives rise to high levels of antibiotic resistant bacteria in the mouth, an effect that lasts for at least half a year, a new study has found. …even after a single – and short – course of antibiotics, a person could spread resistant strains of bacteria to close contacts within a household or a hospital for months. Antipyretics, also known as fever reducers, lower the immune system which can set babies and children up for potentially worse problems. Paracetamol (fever reducer) may prolong infection and reduce the antibody response in mild disease, and increase morbidity and mortality (death) in severe infection. If you can get rid of the vaccine pyrogens that are causing the temperature, it will come down on its own, and the quickest way to do that is vitamin C (sodium ascorbate). Diarrhea is a sign of gut dysbiosis and is a sign there is a significant immunological disturbance in the body. 70% of the immune system is located in the gut, and if you mess with that, the gut allows vital immunological resources to work elsewhere. Foul smelling diapers are also a very common with vaccine reaction. It’s the most obvious indicator that the body is going haywire. The findings were presented here at the annual meeting of the American Academy of Allergy, Asthma & Immunology (AAAAI). So what could be happening? While no one knows for sure, Perzanowski says that acetaminophen use may deplete the lung of an antioxidant called glutathione. Researchers think glutathione, which is found in the lining of airways, may play an important role in preventing damage to the lungs. Fever is often a beneficial host response to infection, and moderate fever improves immunity. Therefore, it may not be a good idea to give drugs that reduce temperature to patients with severe infection. I have recently reviewed 1 the results of 9 controlled trials in mammals of the effect of paracetamol or aspirin on mortality or virus excretion. Four trials found that aspirin increased mortality in bacterial or viral infection. Viral shedding was increased by paracetamol or aspirin in 3 studies, possibly increased in one, and not affected in two (one used only pharyngeal washings, and one had only 9 subjects in the aspirin and placebo groups). One study found that antibody production was impaired by both paracetamol and aspirin, but no effect on antibody production was detected in the study with only 9 subjects in the aspirin and placebo groups. This evidence suggests that aspirin and paracetamol increase mortality in severe infection, and that they may prolong the infection and reduce the antibody response in mild disease. ….It should be explained to parents that fever is usually a helpful response to infection, and that paracetamol should be used to reduce discomfort, but not to treat fever. “The elevation of body temperature by a few degrees may improve the efficiency of macrophages in killing invading bacteria, whereas it (fever) impairs the replication of many microorganisms, giving the immune system an adaptive advantage. There is a simultaneous switch from the burning of glucose, an excellent substrate for bacterial growth, to metabolism based on proteolysis and lipolysis. The host organism also becomes anorexic, which minimizes the availability of glucose, and somnolent, which reduces the demand by muscles for energy substrate. During the febrile response, the liver produces proteins known as acute-phase reactants. Some of these proteins bind divalent cations, which are necessary for the proliferation of many microorganisms. The American Journal of Medicine, volume 88, January 1990, Antipyretic Orders in a University Hospital Stuart N. Isaacs MD et al. Drug used: acetaminophen. Acta Paediatr Jpn 1994 Aug; 36(4) 375 – 378. Risks of antipyretics in young children with fever due to infectious disease. Sugimura T, et al. Eur J. Pediatr 1994, June; 153 (6) 394 – 402. Treatment of fever in childhood. Page 399 “the potential for toxicity of ASA and paracetamol, the two most extensively used antipyretics in the febrile child, underlines the constraints within which treatment decisions have to be made. The fact that both drugs are sold as “over the counter” products, while the medication of child fever often occurs without medical control, should be a matter of concern. N Y State J Med. 1971; 71: 2747 – 2754. Prnumococcal meningitis at Harlem hospital. Richter R W et al. Result: An increase of mortality with absence of fever in pneumococcal meningitis. (Pediatr Vol 103, No 4, April 1999, 783-784 and 785-790. Infect Med 1999 16 (5):307. Chickenpox treated with Tylenol/Ibuprofen provokes bacterial skin infections into fulminant necrotising fasciitis. This happens by prolonging inflammation and down regulating the immune system. It can no longer fully activate the adaptive arm of immunity either. The authors recently observed that frequent paracetamol use was positively associated with asthma and rhinitis in young adults. ….Their associations with national 1994/1995 per capita paracetamol sales were measured using linear regression. Paracetamol sales were high in English-speaking countries, and were positively associated with asthma symptoms, eczema and allergic rhinoconjunctivitis in 13-14-yr-olds, and with wheeze, diagnosed asthma, rhinitis and bronchial responsiveness in adults. The prevalence of wheeze increased by 0.52% in 13-14-yr-olds and by 0.26% in adults (p<0.0005) for each gram increase in per capita paracetamol sales. These ecological findings require cautious interpretation, but raise the possibility that variation in paracetamol usage may explain some of the variation in atopic disease prevalence between countries. Asthma morbidity after the short-term use of ibuprofen in children. In addition to the probability that antipyretics may prolong the course of mild to moderate infectious illnesses, what other deleterious effects might they have? Russell et al. point out that little is known about the pharmacokinetics of these drugs in poorly or malnourished children. Even in developed countries, all available methods of antipyresis must be treated with respect. Warning labels became required for paracetamol recently and for aspirin in the more distant past. In addition to acute poisoning, the former has been implicated in the development of chronic renal disease, and perhaps liver failure, when repeatedly administered over prolonged periods of time . Perhaps more important is the fact that antipyretics mask symptoms or signs; children with pneumonia, for example, may not receive a proper diagnosis because their respiratory rate decreases (4) or because, when the body temperature starts to fall, the child may be considered to be on the way to recovery and thus needing no further observation. Finally, of course, the costs may consume a significant amount of resources that, in developing countries, could be better devoted to specific diagnosis and therapy. Other potential benefits of reducing fever are sometimes cited to justify the use of antipyresis. A common assumption is that these drugs make patients feel better, but no clear evidence shows that this is so. Parents and physicians consistently cannot distinguish between the effects of placebo and paracetamol in most circumstances. Perhaps the exceptions are conditions accompanied by pain, for which the analgesic effects of the medication provide the benefit. When fevers rise above 39.5 oC, a reduction in body temperature is sometimes accompanied by an improvement in subjective symptoms, but this is inconstant, with young children seeming to benefit more than older children. The major problem when evaluating the subjective effects of antipyretics is that they have an enormous placebo value – as various studies have shown. Despite the firm belief in the effects of antipyretics, children do not feel any better, eat better, or become more active after their use than they do after they receive placebo. The argument that the use of antipyretics reduces the occurrence of febrile seizures also is not based on evidence: no studies have shown this to be true. Even in children with previous febrile seizures, the use of antipyretics has not been helpful. Some physicians believe that the response to antipyretics can be used to differentiate between bacterial and viral infections, with the latter responding more completely and promptly. Numerous studies have shown this to be a fallacy. Acetaminophen overdose is the leading cause for calls to Poison Control Centers (>100,000/year) and accounts for more than 56,000 emergency room visits, 2,600 hospitalizations, and an estimated 458 deaths due to acute liver failure each year. Data from the U.S. Acute Liver Failure Study Group registry of more than 700 patients with acute liver failure across the United States implicates acetaminophen poisoning in nearly 50% of all acute liver failure in this country. Available in many single or combination products, acetaminophen produces more than 1 billion US dollars in annual sales for Tylenol products alone. It is heavily marketed for its safety compared to nonsteroidal analgesics. By enabling self-diagnosis and treatment of minor aches and pains, its benefits are said by the Food and Drug Administration to outweigh its risks. It still must be asked: Is this amount of injury and death really acceptable for an over-the-counter pain reliever? The advisers never saw that draft, however, and none of these key options ended up being clearly presented to the committee by the FDA in the final list of questions they were to consider. …. “The committee would have preferred more focused questions,” he said. According to one FDA insider, the draft questions were dropped because senior FDA managers saw them as too offensive to Johnson & Johnson. Asked about this alleged corporate influence within the FDA, Dr Cantilena smiled and said he did not want to speculate. Eur J. Pediatr 1994, June; 153 (6) 394 – 402 Treatment of fever in childhood. Antipyretics appear to prolong illness by reducing the temperature, thereby disabling the body’s full ability to deal with whatever is the problem. In a nutshell, the lower the temperature, the longer the duration of illness. The higher the temperature, the shorter duration of illness. Immunologically, temperatures from infection are specifically designed to speed up and kick the immune system into gear, release cytokines and other immunological forces to deal with the problem.